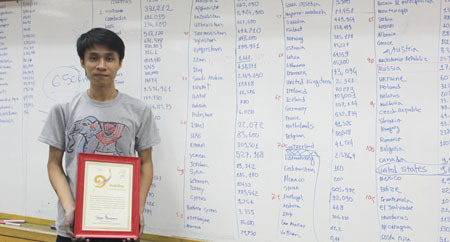 A Vietnamese student at a Thai University has won a place in the Thai Book of Records for his incredible memory. Duong Anh Vu, 27, from the southern central province of Ninh Thuan, who is studying at Chulalongkorn University, beat the record for memory with a remarkable two-hour challenge. He memorised 108 columns of data about 206 countries and territories, with 22,248 items related to economy, culture, politics and society. He also memorised and located 2,500 places on the world map. Vu is now trying to memorise more than 1,000 literary works and 20,000 places for the next contest to be held in September.